Have you ever thought about what impact the insulation industry has on the overall U.S. economy? In comparison to many industries the insulation industry is relatively small, but its impact should not be underestimated. 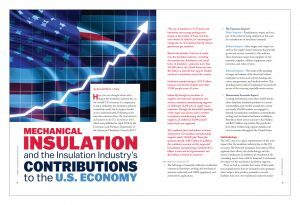 Following is the executive summary from The Contributions of Insulation to the U.S. Economy in 2017, which was published in April 2018 by the Economics and Statistics Department of the American Chemistry Council (ACC). “The use of insulation in U.S. homes and businesses saves energy, putting more money in the pockets of home and business owners. In addition, by consuming less energy, the use of insulation directly reduces greenhouse gas emissions. Beyond the benefits of the use of insulation, the insulation industry—including the manufacture, distribution, and installation of insulation—generates more than 500,000 jobs in the United States and over $30 billion in payrolls that support families and local communities around the country. Insulation manufacturing is a $13.9 billion business, and directly employs more than 37,000 people across 42 states. Indirectly, through its purchases of supplies, raw materials, equipment, and services, insulation manufacturing supports an additional 52,000 jobs in supply-chain industries. Through the household spending of the wages and salaries paid to workers in insulation manufacturing and their suppliers, an additional 60,000 payroll-induced jobs are supported. • The full range of materials utilized in residential, commercial (envelope, roofing, and mechanical systems), industrial, and OEM (appliances and automotive) applications. Direct Impacts—Employment, wages, and output of the industry being analyzed; in this case, the manufacture of insulation materials. Indirect Impacts—Jobs, wages, and output created by the supply-chain businesses that provide goods and services essential to the industry. These businesses range from suppliers of raw materials, supplies, utilities, equipment, transportation, and other services. Inducted Impacts—The result of the spending of wages and salaries of the direct and indirect employees on items such as food, housing, education, transportation, and medical services. This spending creates induced employment in nearly all sectors of the economy, especially service sectors. Looking downstream, more than 44,000 wholesalers distribute insulation products to contractors/installers, and retailers around the country and nearly 450,000 workers are engaged in drywall and insulation installation, nonresidential roofing, and mechanical insulation installation. Payrolls in those sectors amount to $2.9 billion and $25.7 billion, respectively. The paychecks from these workers help support families and local economies throughout the United States. The ACC report is a great representation of the total impact that the insulation industry has on the U.S. economy. The National Insulation Association (NIA) applauds their efforts, the methodology, and the report contributors. In addition, we wondered if the overriding report data could be dissected to determine the impact of the mechanical insulation segment. First, we had to consider that many of the insulation manufacturers that are included in the upstream direct impact data produce materials in several facilities that cross over traditional market boundaries, which influences the upstream and downstream calculations. Second, we determined there was not any substantial upstream indirect overlap with the supply chain and contracting of mechanical insulation versus other insulation segments. And third, we needed to develop a methodology by which to carve out the mechanical insulation segment from other industry segments. By comparing the ACC 2016 and 2017 reported data, combined with analysis of the information provided by the NIA to ACC for compiling the 2017 report, we were able to extrapolate the potential mechanical insulation impact on the U.S. economy. Following are excerpts from the ACC Executive Summary (noted in italics) and NIA’s best estimate of the mechanical insulation industry component (noted in bold). ACC states the insulation industry—including the manufacture, distribution, and installation of insulation—generates more than 500,000 jobs in the U.S. and over $30 billion in payrolls that support families and local communities around the country. We estimate the mechanical insulation industry represents approximately 25% of those jobs—and potentially as much as $9 billion of the payroll dollars. Insulation manufacturing is a $13.9 billion business, and directly employs more than 37,000 people across 42 states. We estimate that of the 37,000 manufacturing jobs, 16,000 +/- (43%) manufacture materials used in the mechanical insulation industry. We also estimate the mechanical insulation industry indirectly, through its purchases of supplies, raw materials, equipment, and services for the manufacturing of insulation, supports an additional 9,000 +/- (17%) of the 52,000 jobs in supply-chain industries. The household spending of the wages and salaries paid to workers and suppliers in insulation manufacturing, an additional 10,000 +/- (16%) of the 60,000 payroll-induced jobs are supported. In addition, the combined economic activity supported by insulation manufacturing contributes $1.2 billion to state and local governments and $2.4 billion in federal tax revenues. While it is difficult to extract the mechanical insulation component for these totals, by comparing the reports from 2016 (without mechanical insulation) and 2017 (with mechanical insulation), the mechanical insulation segment could represent over half a billion dollars in federal and state income tax. Every 2 years, NIA conducts a survey to gauge the size of the mechanical insulation and laminated metal building insulation industry segments. This survey began in 1997 to gain data about the size of the mechanical insulation industry, which had not been measured before that time, and added the laminated metal building insulation segment in 2013. The survey is sponsored by NIA’s Foundation for Education, Training, and Industry Advancement, and aims to provide valuable data regarding market size and growth rates for the U.S. commercial and industrial mechanical and laminated metal building insulation market. The survey goes out to NIA’s Associate members, who are manufacturers of insulation products or insulation accessories. The survey asks those members to provide information about their sales volume, and then a third-party company—using this information and formulas created by NIA—determine the annual size of the respective U.S. insulation industry segments. Following are the 2015–2016 NIA Industry Measurement Survey results for the mechanical insulation component, which indicated the 2010 market to be reasonably comparable to actual 2016 and 2017 forecast. With that comparison we could estimate that 2017 employment levels and mix to be similar to 2010. As the graph indicates, even with considering the impact of the recent recession in 2011 and 2012, the mechanical insulation industry experienced a growth trend through 2016. It is expected that the next survey for 2017–2018 will raise the trend line as forecasted. While the ACC report and NIA surveys were conducted at different times and employed varying methodologies, the results support similar conclusions. The insulation industry makes vital contributions to the U.S. economy. The insulation industry also delivers many environmental benefits, such as reduced energy consumption, which translates directly into lower emissions of greenhouse gases. Insulation, and specifically mechanical insulation, promotes employee and public safety, protects the environment, and contributes to the competitiveness of U.S. industry by lowering operating and production costs. The economic activity generated by the U.S. insulation industry is broad based and helps support economies across the U.S. economy, from manufacturing, to distribution/fabrication, to installation. The mechanical insulation segment is a substantial part of the overall insulation industry and its contribution to the U.S. economy is impressive.